TEAC unveils two new high-res audio components | What Hi-Fi? TEAC's UD-503 USB DAC/headphone amplifier and the NT-503DAC USB DAC/network player can either be used as part of the brand's Reference mini component system, or as standalone units. 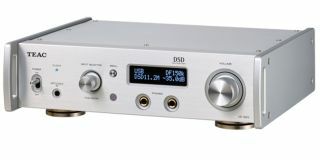 The UD-503 is the successor to the UD-501 and still features dual-mono architecture and a high quality headphone amp with balanced/unbalanced outputs. Under the hood you’ll find twin AKM Verita AK4490 DACs which support up to 11.2MHz DSD and 32-bit/394kHz PCM files. A fully asynchronous USB transfer mode allows the DAC to control and sync incoming PCM and DSD audio signals using the built-in 44.1kHz and 48kHz clocks. An optional external 10MHz master clock can be added for greater precision. The dual-mono circuitry ensures left and right circuits are kept separate from the power supply to the output stage. A digital isolator is installed to prevent digital noise interfering with the power supply. TEAC says the UD-503 can act as a preamp when used with power amps and active speakers, and analogue RCA inputs mean legacy components can be partnered too. The company’s own High Current Line Driver (HCLD) circuit not only supports single-ended headphone output, but balanced and Active GND modes too. The TEAC UD-503 is available now in black or silver for £700. The NT-503DAB meanwhile not only supports high-res audio over USB, but also high-res streaming over a network. DSD 5.6MHz and 24-bit/192kHz WAV/FLAC files can be played back from a PC or NAS drive. The NT-503DAB has built-in DAB/DAB+ radio support, as well as Spotify, Deezer, TuneIn radio portal and aptX Bluetooth. Finally, a single-headphone output benefits from TEAC’s HCLD (High Current Line Driver) circuit to “deliver mostly Class-A performance for single-ended headphones of up to 600ohms”. The TEAC NT-503DAB will be available at the end of November in black or silver, priced £950.